If a healthcare professional rebukes the input you provide into the care you are about to receive, take that as a sign you need to seek care elsewhere. Immediately! I attended the Patient Experience, Empathy and Innovation Summit hosted by the Cleveland Clinic in May. Sessions covered a wide range of topics, including insight into how technology such as wearables, apps, and greater access to information about patients is influencing the delivery of care, and with it, the experience of care by patients. At the end of the day it was clear, engaging with patients honestly and with empathy, and inviting them to participate in the care they are to receive will never go out of style. It is encouraging to see the renewed focus and importance placed on the power of what have long been viewed as the “soft skills” of medicine. There are many of us, including an increasing body of research, who understand the healing properties of touch, a smile or a kind word to help reframe a healthcare encounter. What truly made the content shared in Cleveland come to life, however, was viewing it all through the lens of a conversation I had with a close friend who recently went through treatment for breast cancer. I am most happy to report that my friend is now almost two years cancer free. With a family history that is all too weighted in favor of a recurrence, she is taking each day as a gift while at the same time remaining vigilant of every new ache or pain. When she was first “discharged” from treatment last year, she expressed dismay at how quickly and easily her “care team” said goodbye and good luck. With no more follow up visits to an oncologist or surgeon, and no more chemo or radiation appointments to attend, she also had no one regularly monitoring a disease that had taken the life of both her sister and mother. With no one holding some type of medical authority to give her a reassuring touch on the arm, or an all-clear from regular blood work, she has been left to wonder what the future holds alone. And I was left to wonder how post-cancer care can be so lacking in empathy for a patient, a person, who just experienced one of life’s most challenging events. They just seem to care so much more. It’s as simple as the gowns. 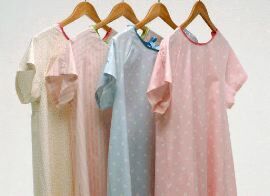 Here the gowns are warm, soft and pink. When I would go to put a gown on at the old place, is was scratchy, cold and old, barely covered me and often tied in knots. I would sit there trying to untie knots in the gowns and get frustrated. The image of my friend sitting alone, uncovered, frightened of what her future holds, and struggling to untie these knots brought tears to my eyes. Someone easily could have been mindful of making sure the gowns were easy to put on and take off; that they brought comfort instead of more anguish. Admittedly, it is a challenge to turn healthcare culture around on a dime, but can’t we at least hit the mark with the simple things? Couldn’t we try to make the entire experience of care feel like putting on a warm, soft, pink gown, even if we struggle to fix bigger system’s issues? As her care continues at the new facility, she is also learning more about the way health systems work because people who work within this system are taking time to talk with her, explain things and put her mind at ease. She also feels more comfortable and welcome within in the new system, and is asking more questions. For example, she learned that her oncologist back home was not necessarily ignoring her by sending in a mid-level practitioner to talk with her. In fact, it was a signal that her recovery was going well because she did not need the oncologist’s time. Wouldn’t it have been nice to know this as a patient in their care, versus wondering about the quality of care being received as well as one’s prognosis? At a recent surgical follow-up visit, my friend’s new surgeon took time to explain the procedure he had performed in detail, describing what he had done and how he thought she was healing. Not only did he take time to talk science, he asked her how she was feeling, and told her “it was his pleasure” to be of service to her. He used phrases that real customer service focused industries use, and my friend picked up on this because she works in the hospitality industry and notices things like this. And she notices when the simple niceties of customer service are lacking. Do you know who your patients are? If you haven’t asked, it might be a good idea because they have skills and they are paying attention. Maybe just these few patient engagement/experience tips could be bullet-pointed and handed out at white coat ceremonies, or posted in hospital break rooms across the country. I’m hoping my friend will choose to become a patient advocate at her new location, as she has much to offer. Her first agenda item is to become well, and perhaps then she will share the wealth of knowledge she has acquired over the last two years about good and bad healthcare delivery. And while the new system is far better in her experience, she still has experienced bumps in the road. There is so much patients can teach us about what we do well, and where we need to improve, but they need to be invited into a conversation. Start today by asking a patient how he or she is feeling, if there is anything they need. or if you can be of greater service. 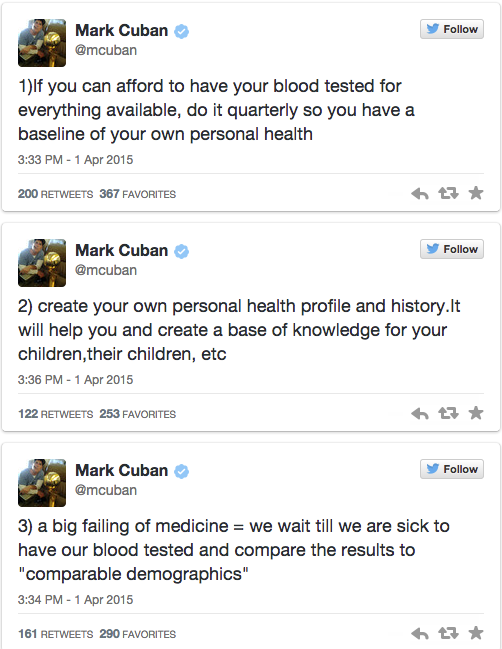 We need more innovators with the resources of Mark Cuban to jump into the conversation around engaging patients in their health and changing healthcare for the better. To have those ready and willing to invest in validating the value of being empowered by owning our own data is priceless. Waiting for the traditional pathways to decide how we will do so is taking too long. With technology exploding around the ensconced world that is traditional medicine there are far too many viable options available. Theranos, created by Stanford dropout Elizabeth Holmes, is one such innovative company now said to be valued at $9B. Holmes is brilliant and is trying to democratize medicine — to make it affordable and less painful and scary for every person to have their blood drawn, and as a result, better understand their own health. My hunch is that Cuban has a stake in Theranos, and more power to them both. This is access to care and innovation without the roadblocks of the traditional route. Funny how sometimes the house of cards built by information fall together. Dan Munro once again beat me to the punch on this topic, as we have been talking about patient engagement versus a patient’s responsibility versus commitment to one’s health for some time in our own healthcare circles. To watch the attention this topic has pulled from the power levels of business and healthcare via social media is both exciting and validating. Patients, however, still need to be invited into the conversation and Twitter feeds, and this may just prove to be the true value in having Cuban involved. His 2.8M Twitter followers were just pulled into a conversation rarely invited or influenced to engage in. And finally, the debate over how often or why/why not to test your blood quarterly per Cuban’s suggestion is a curious one. I understand all too well the argument for overtreatment, as colleague and author of The Treatment Trap and Wall of Silence, Rosemary Gibson, speaks of it often. But is this the same overtreatment patients need to be wary of? The trip to the cath lab when medical management will do? The shoulder or back surgery when physical therapy may prove far better? Or worse, the criminals who prescribe chemotherapy for patients that do not really have cancer? …What I do know is that I’m in firmer control of my day to day health…there is value when I review my results annually with my doctor , having the last 3 results to compare to. Now that I have a history of data looking at the results isnt stressful. Its the opposite. Its comforting. And I feel far more confident that if and when I get sick, having those numbers will make me and my doctor smarter in our decision making process. I know that healthcare needs more Mark Cubans. So much so, that while I thought Shark Tank to be a somewhat intriguing TV concept before, I am even more inclined to watch knowing he is engaging not only in his own health so thoughtfully, but also because he may be keeping an eye out for the next Theranos. Stay tuned to ETY as we continue to elevate the conversation around patient engagement, patient and care team partnerships and more in the coming weeks. Please share your thoughts! Trying to get and keep the attention of busy healthcare professionals with content related to new initiatives can be a challenge to those leading culture change in healthcare. 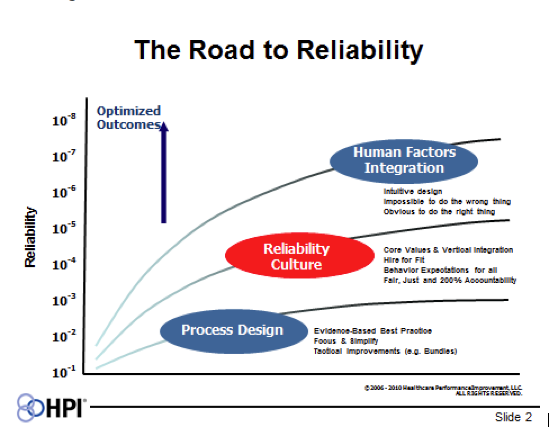 So many healthcare organizations are choosing the path of high reliability, greater patient engagement and shared decision-making, and a 5-star patient experience–all areas which will help us achieve zero preventable harm for patients. With the adoption of a new agenda comes the acquisition of new knowledge for all involved in executing and delivering on the programs. SolidLine Media has been a partner in developing award-winning healthcare content just south of ten years, and continues to hit the mark most recently with their Minute for Medicine series which includes (52), one-minute episodes containing quick, entertaining hits on several different domains key to providing the safest, highest quality care to patients. Knowing all too well the value a simple, turnkey solution can provide to so many looking to share information without having to start from scratch or develop it themselves is the driving force behind sharing this tool. And in the interest of full disclosure, I am a partner in the series. Check out the following, or go to Minute for Medicine for more information on how to take part yourself! Share feedback on the series, and/or please share additional tools your teams have found effective in sharing and creating meaningful content within your healthcare organization! We don’t have time to recreate the wheel — it’s time to pick up the pace for patient safety! Director Nino Kirtadze had no idea the patient education tool she created in the somewhat engineered documentary film, Don’t Breathe–a film intended as a study in the fragility of human nature. From my seat, however, the story she captured only further illuminates how in-the-dark many patients remain when it comes to their own health, and the care they receive. While the trailer alone tells the story many intimate to healthcare live each day, discussion after the film revealed the team had no intention of using it to educate patients–even as the gentle main character traveled from one doctor to another, enduring professional and unprofessional examinations, his diagnosis becoming more and more ridiculous, almost comical, and all too close to reality in many circles of care. Almost comical that is, if you ignore the fact this man was experiencing in “real life,” the fear which accompanies any suggestion by a healthcare professional that one might need surgery, have heart disease or worse. How can this story, or even simply the film trailer, be used to educate patients on the need to speak up and ask questions about what their healthcare professional may or may not be telling them? And as a related aside, I give the Toronto International Film Festival (TIFF), and Toronto, 5 glowing stars. The line-up of film premieres, number of A-List attendees, quality of venues and restaurants all within walking distance, and the ability to see the top films, were unmatched by past experiences at Sundance or the Chicago Film Festivals. Next year will be TIFF’s 50th Anniversary, and I look forward to returning. On the bucket list next, Cannes! Healthcare and media colleagues who are on Twitter always prove to be highly knowledgeable and great sources of information. I can plug-in anytime and find the trending topics of the day. I can literally be in more than one place — following conferences or meetings remotely via hashtags. I can meet and discuss topics of interest with people I have never met. I can share an idea and get feedback from peers. For example, following is Tweet I sent this week and have received some great comments in return. WHAT DOES PATIENT CENTERED CARE MEAN TO YOU? Please reply by comment, email (tgranz24@yahoo.com) or Twitter (@tgranz)!